You can have a new smile in one day! All-on-4® dental implants are becoming the new standard for denture wearers or those with missing teeth. Why? Because they can restore the function and beauty of your smile in a way no other dental treatment can! The All-on-4® process provides the permanent replacement for the entire upper or lower set of teeth with a denture. The best part? It can all be done in one appointment! Step 1 – Four dental implants are placed to provide the foundation for your new smile. Step 2 – Temporary dentures are immediately attached to the implants that will look and feel like natural teeth. You’ll walk away with a new smile! Step 3 – When the implants have healed and integrated with your jaw, impressions will be made for your permanent dentures. Step 4 – After your custom-crafted dentures are completed, we will replace the temporary ones and make sure your new smile looks just right on you. Why Do Our Patients Love All-on-4® Dental Implants? This is the easy, effective, and affordable solution they've been looking for! 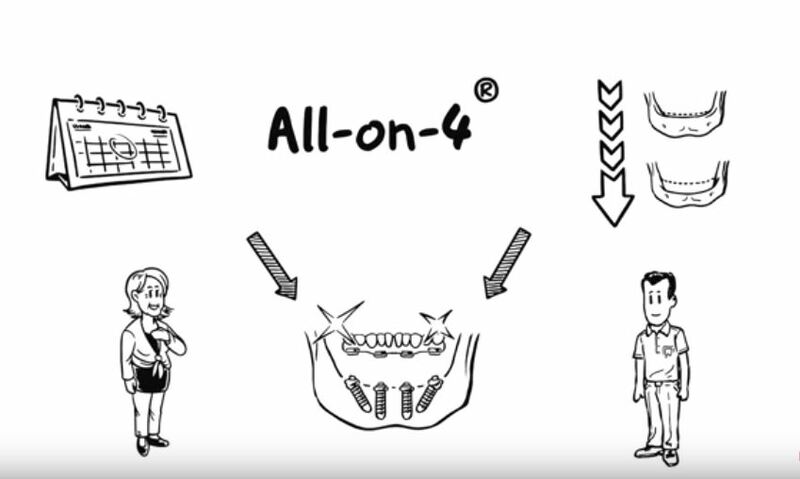 All-on-4® implants let you have a new, complete set of teeth to use in just one visit. What could be faster than that? No more embarrassing denture slippage. You can smile and laugh with complete confidence that your new smile will stay in place. All-On-4® dental implants are built with durable materials that, with the proper care, can last a lifetime. Missing teeth and slipping dentures can make it hard to speak. Securely placed dentures or bridges let you enunciate clearly and speak with confidence. Have you been missing out on your favorite foods because they were too difficult to eat? Go ahead, indulge yourself! Dental implants help to retain vital underlying bone tissue. Your lips, facial muscles, and smile will have the supportive foundation they need to keep a youthful appearance. Why Choose Dr. Walker for Your All-on-4® Dental Implants? His training and experience make him the only choice! Dr. Robert Walker is known throughout the area as a Chandler, AZ dentist who goes above and beyond just standard care for his patients. He and his talented team work hard every day to make sure his patients feel they have had the best dental treatment and care they’ve ever experienced. For All-on-4® dental implants treatment, Dr. Walker works closely with a local, expert periodontist who performs the precision implant placement, and then Dr. Walker finishes the final denture placement and smile design himself. His reputation for being a perfectionist works in your favor. He won’t be happy with your new smile until you are! Learn how Christy’s experience with All-on-4® dental implants changed her life. You Can Have a New Smile in Next to No Time!